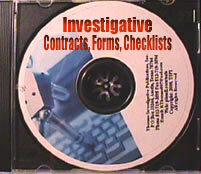 INSTANT INVESTIGATIVE FORMS AND CONTRACTS! And Releases! Open On Your Computer And Modify For Your Own Needs! These forms will open in both Microsoft Word And Word Perfect as well as any other word processing program that supports rich text format documents.